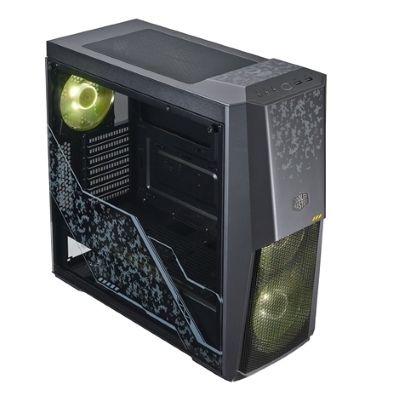 Cooler Master is known for its desktop components and peripherals and already has an extensive line-up of products. They have announced an expansion on current products and are introducing a few new ones in Taipei at Computex 2018. We begin with the top-of-the-line, flagship, COSMOS C700M which is a redesign of the stylish COSMOS C700P. Details are scant, but Cooler Master touts RGB lighting and ominous “new tech” built into this high-end, full-tower case. In typical Cosmos style, there’s a ton of room for water cooling given it’s a full tower design and the use of steel and tempered glass give it one sleek look. Cooler Master has also broken away from tradition giving builders the option of many different motherboard positions and component configurations in this redesign. 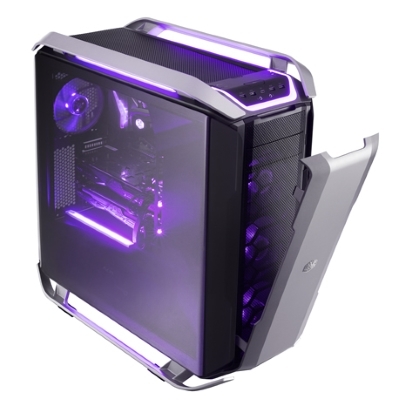 The photo below is the original COSMOS C700P, but it will give you an idea of the style since no photos of the new case were available but it uses the same chassis. Moving on to the popular MasterCase family, Cooler Master is introducing the aluminum MasterCase SL600M. This will be the first case in the “SL” lineup, focused on silent operation. A “chimney design” aids in cooling by “bringing cool fresh air into the bottom of the case using two 200 mm fans and exhausting out of the top.” The power supply is located behind the front panel and this area is completely closed off from the components area of the case. At the top of the H-Series is the MasterCase H500M. 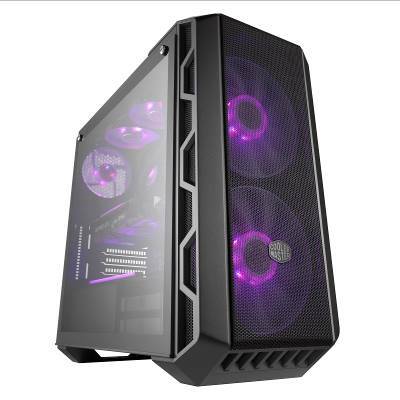 This case is chock-full-of features, including PSU shroud with removable cut-out, changeable front panel (mesh or tempered glass) and up to 360mm radiation compatibility (front and top). 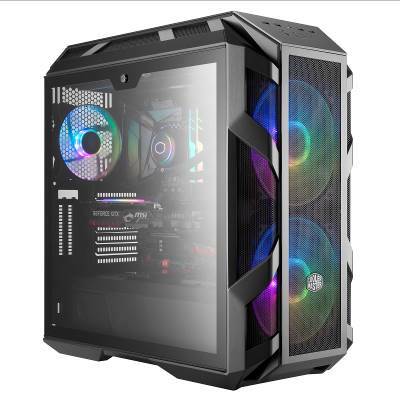 The MasterCase H500 shares a lot of similarities with the H500M, it offers options to maximize aesthetics and airflow by including both the transparent front panel and mesh panel. Cooler Master has also added vertical PCI cutouts for displaying your graphics card, this requires an additional riser cable which is not included. With the MasterBox MB511, airflow is the main focus with a mesh front panel and side intakes with red “racing strip” lighting. The MasterBox MB520 focuses on lighting with a transparent front panel that offers a view of the illuminated fans. 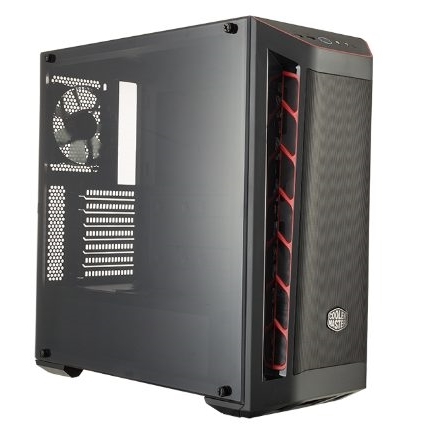 Both models support up to six 120 mm fans between the top, front, and rear of the case. The MasterBox MB530P has similar side intakes, but has tempered glass on both sides and the ront panel allowing full view of RGB components included with the case. On the other hand, the the MasterBox K500P features a unique type of mesh that refracts light differently, enhancing the look of the front RGB fans and PSU shroud. The TUF Gaming Alliance brings together ASUS, Cooler Master, and others to design products with a military theme. The MasterBox MB500 TUF Gaming Edition embodies this theme, plus features three 120mm RGB fans and support up to a 360mm radiator in the front. Cooler Master also has several mod projects on display at Computex. One of the more unique projects is a collaborative effort with renowned modder, Nhenhopiohach. This modular design was originally entered into the PlayerUnknown’s Battlegrounds™ BATTLEMODS Asia Tour 2017 with Project Crosshairs. It could end up as a future in-store product, allows users to swap their system between multiple Cooler Master cases in seconds without having to disassemble the build. Cooler Master is also expanding their power supply lineup with new entries in the “V” series. They will be releasing a new line of fully-modular, V series units with a platinum efficiency rating. The specifics are not yet available, but it has been indicated that multiple models in this new series will be available to see firsthand at Cooler Master’s booth during Computex. Now for the first time ever Cooler Master has designed and manufactured their own PSU completely in-house. The PSU is being called simply XG. Cooler Master claims that this brand new power platform is not only a “milestone” for them as a company but “for the entire PSU market.” XG from Cooler Master has a display on one side which will show temperature, fan speed or current power draw. Stay tuned for more exciting news from Computex 2018. If you're wondering what the CM Cosmos C700M looks like.